Since 2012, the McGill University Health Center (MUHC) has been imposed budget cuts of $120 million, which have had disastrous consequences for the quality of patient care, access to treatment units and heavy workload for the nurses of the hospital, firmly denounces the Coalition Avenir Québec. CAQ members of National Assembly for Montarville and Repentigny, Nathalie Roy and Lise Lavallée, give their support to MUHC nurses’ and cardio-respiratory professionals, who launched a petition signed by nearly 14 000 people, demanding that the liberal government stops all budget cuts initiated by the previous PQ government and perpetuated by Premier Philippe Couillard. The CAQ promises to hand over the petition to Minister Barrette in September. 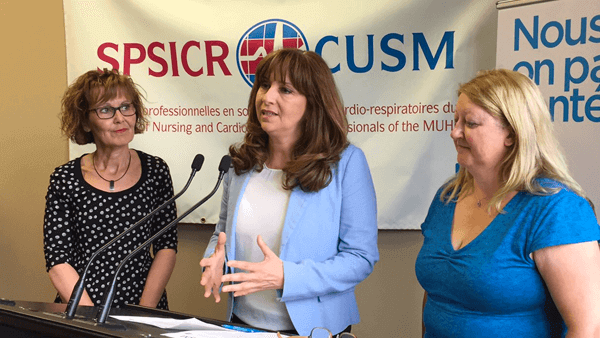 Nathalie Roy calls Gaétan Barrette to stop playing with nurses’ morale and to guarantee the necessary budgets at the MUHC so that Montreal patients have access to quality care. According to Ms. Roy, it is unacceptable that because of major budget cuts, medical beds will close for the summer, patients are crammed into hallways and units remain empty due to lack of funding. The CAQ critic for public health, Lise Lavallée, added that because of the insufficient number of professionals at the hospital, some patients don’t have access to services within the promised deadlines, particularly those that require long-term care.